The Adoption and Foster Care Alliance of New Mexico (the "Alliance") is comprised of professional individuals, agencies and organization members, including adoption and foster care service providers and attorneys, who are committed to promoting superior services for children, parents who may need to find an adoptive home for their infant or child, adoptive parents, and foster families, through outreach, direct services, education, and advocacy. Alliance members work exclusively or primarily in the field of adoption and foster care. The Alliance works closely with the Children, Youth, and Families Department (CYFD) to promote better outcomes for New Mexico's children and families. You are welcome to contact our members for additional information and competent services. The Alliance was formed in the early 1980's to answer a need for support and education among professionals who help parents facing unplanned pregnancies; those who recruit, prepare, and support loving, and nurturing adoptive and foster families; and those who ensure legally secure adoptions. The Alliance promotes high standards of practice and the ethical delivery of services to all parties. The Alliance's advocacy efforts have included active involvement in revisionsof the Adoption Act and legislation impacting adoption and foster care;advocating licensure requirements for adoption counselors; increasingawareness of and compliance with the Indian Child Welfare Act; promotingthe federal adoption tax credit; and educating professionals and courtsabout implementing new statutes affecting domestic and inter-country adoptions and a public outreach program informing the public of the Putative Father Act. The Alliance meets bi-monthly on the second Tuesday of January, March, May, July, September and November. Meetings are held from noon to 2pm at Adoption Assistance Agency at 2800 Eubank Blvd NE, Albuquerque NM 87112. The phone number there is 505 821-7779. Adoption/Child Placement & Foster-Care Agencies provide full support services in counseling, education, supervision to: foster families, parents with a crisis pregnancy or who are considering a foster or adoption plan for their child, prospective adoptive parents and adoptees. Most provide services state-wide. Independent Adoption Social Workers/Counselors provide counseling and education required for all members of the adoption triad. They provide home studies and post placement adoption services for prospective adoptive families and usually have professional agreements with licensed adoption and foster-care agencies. *An Associate member is one who has less than one year of significant experience in the field of adoption. Attorneys provide a full spectrum of legal services required in adoption and foster-care proceedings. Starting around the year 2000, New Mexico residents became increasingly drawn into illegal, risky and expensive adoption processes by out of state facilitators or multi-state adoption businesses and agencies. Members of the Alliance reviewed legislation from other states and drafted proposed legislation to restrict predatory adoption practices by out of state entities in our state and worked on passing similar legislation in New Mexico to help restore ethical adoption practice here. After seven years of lobbying New Mexico became a No Facilitator State March 3, 2012. The Alliances thanks the sponsor of these bills, Representative Al Park and Senator John Ryan for their efforts to restore ethical adoption practice in our state. Only an attorney, child placement agency, investigator or counselor licensed in New Mexico or another state where the adoption service is being facilitated may provide an adoption service for compensation. 4. A full financial accounting of all disbursements for adoption services must be approved by the Inter-state Compact on the Placement of Children or a NM Courts. ADVERTISING RESTRICTIONS "advertise" means to communicate, market, promote, induce or solicit by public media originating or distributed in New Mexico, including newspapers, periodicals, telephone book listings, outdoor advertising, radio, television or other electronic media. (5) a prospective adoptive parent who is acting alone on the prospective adoptive parent's own behalf and who has a current, approved pre-placement study as required by the department (CYFD). 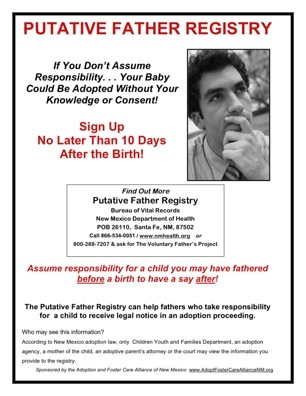 We developed and distributed this poster statewide to help increase awareness of the importance of fathers assuming responsibility for a child before it is born if they want to have a say in an adoption proceeding. Help Spread the Word ! Print and Distribute our Putative Father Registry poster!